This promotion is open to those who do not yet have a UTrade online trading account. Step 1: OPEN A UTRADE ACCOUNT > Open an online stock trading account with UTrade and follow the step-by-step instructions indicated online Once UTrade receives your documents, note that initial funding is also required in order for your account to be processed. Step 2: WAIT FOR THE DISCOUNT CODE > Once your UTrade account has been opened, you will receive an email with the log-in instructions. We will also be sending you an email with your ZALORA discount code which entitles you to 18% off for minimum spend of Php 1,500. Step 3: LOG ON TO THE ZALORA WEBSITE AND SHOP! > Upon checkout, click “Have a promo code? Enter it here” and enter the promo code provided by UTrade. Click Apply. The discount will be deducted from the subtotal. Click Order Now to finalize the order. The discount is valid on sale items. 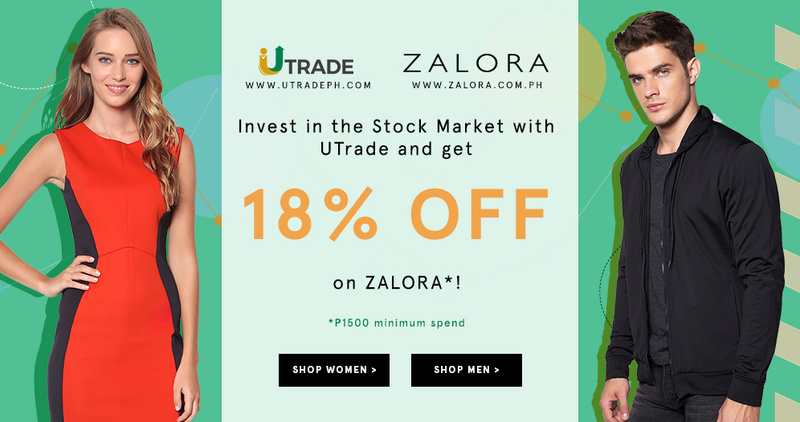 The discount applies to all participating brands except brands and categories found on www.zalora.com.ph/faq-non-sale. For any questions or clarifications regarding the Zalora website, please contact ZALORA Philippines hotline at +632-858-0777 or email customer@zalora.com.ph. For any questions related to your UTrade account, please contact the UTrade direct line at +632-823-5344 or email utrade@unicapital-inc.com.